With 2 stroke technology, this gas-powered leaf blower from Hitachi has reduced emissions, and it’s a powerful performer with air speeds up to 170 mph. Able to handle large quantities of leaves, debris, and grass clippings, it even picks up wet leaves. Fairly lightweight at just over 8 pounds, it’s easy to hold and maneuver. Having to mix the oil and gas at just the right ratio may be a hassle, but the start-up process is fairly straightforward. 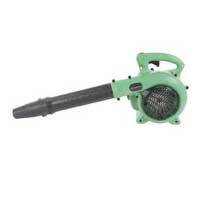 Overall, for $122.73, this Hitachi leaf blower gets yard work done efficiently.